Post-Workout Carbs – Crucial or Counter-Productive? Myth-busting time! 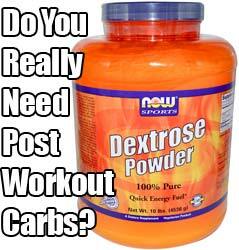 It’s been probably about 7 years since I last dumped dextrose into my post-workout shake. Why did I stop? Adding carbohydrates to your Post-Workout (PWO) shake has no impact on fueling muscle growth and can only serve to add needless sugar and calories to your diet. ‘Protein Synthesis’ refers to the generation or creation of new proteins. You could think of this as the build-up of new muscle. ‘Muscle Protein Breakdown’ refers to the degradation, breakdown, or loss of protein. We actually create this process when we train, which acts as a stimulus for the body to start building new proteins. ‘Protein Accretion’ is the difference between protein synthesis and breakdown. Obviously for muscle-building purposes we want high protein synthesis levels and low breakdown levels for maximum protein accretion rates. (1) Study shows inclusion of carbohydrate in post-workout shake does not increase protein synthesis. The following study  took place in the Netherlands, the subjects being healthy young men. The study split the men into 3 groups, each ingesting a different combination of protein & carbohydrates. Therefore the only variable was the level of carbohydrate. The addition of carbohydrate (whether in small or large amounts) did not further increase protein synthesis at all. (2) Another recent study  showed that the addition of carbs to a post-workout shake did not change levels of protein accretion at all. A criticism some may have of the above study is that while carbohydate may not help in increasing muscle protein synthesis rates, it may help with decreasing muscle breakdown rates. The following study showed that this is not the case. As with the above study, the addition of carbs did not further increase protein synthesis rates. Additionally, it was shown that they did nothing to decrease the rate of muscle breakdown at all. Protein accretion was the same with or without carbohydrate. Insulin is beneficial in the post-workout period. It helps shuttle the amino acids from our protein into our muscles for repair and growth. The popular thinking is that carbohydrate is required to maximally stimulate insulin release to get this job done. However, this just isn’t true. Protein alone will stimulate the release of all the insulin you need. A fast-digesting protein such as whey causes a spike in insulin. Insulin release from carbs, protein, and fat. The ingestion of extra carbs (even in high amounts) will increase the release of insulin, but this extra amount just isn’t required. Because the body needs amino acids for growth, and you also get all the insulin you need from protein alone, there is just no good reason to be dumping all that sugar and calories into your blood stream after a workout. In order to keep fat-oxidation (using fat for energy) at maximum levels, it would make sense to leave the carbs out of your post-workout shake. In doing so you encourage the body to tap into its stored fat. We want to our post-workout shake to be as fat-free as possible because fat will slow the absorption of protein into the bloodstream. So whey protein in water or low-fat milk with zero carbs is the way to go for maximizing fat oxidation in the post-workout period. The exclusion of post-workout carbs was one of the most beneficial moves I have made. It contributes to me being able to stay lean all-year round (see my full strategy in this post). It also leaves 200-300 calories per day that I can enjoy in food form instead of wasting them on unhealthy sugar-water. Having this needless sugar is even worse for people who are cutting. You stop the fat burning process and rob yourself of 200-300 Calories you could have had in solid food form, which would have helped you feel full. If you want to cut fat fast – I call it “aggressive fat loss“, check out my program Total Six Pack Abs. You may say I’m biased, but I believe it’s the best, most effective cutting strategy on the planet. It’s helped men and women of all ages get ripped and even win competitions. See here for more. And don’t worry, you’ll keep on weight training and gaining in the gym with T.S.P.A. Plus the plan comes with a no-quibble 8-week money-back guarantee for you to try it out at absolutely no financial risk on your part. References:  Coingestion of carbohydrate with protein does not further augment postexercise muscle protein synthesis. Am J Physiol Endocrinol Metab. 2007 Sep;293(3):E833-42. Epub 2007 Jul 3. This is based on the fact that insulin aids the transport of creatine into skeletal muscle. Actually, whey protein and/or amino acids can perform this job well enough on their own without the carbs. From what I’ve read, using post-workout carbs greatly increases the effectiveness of creatine monohydrate as a post-workout supplement. What are your thoughts on this? Will a post work out help repair muscle if requird because my body is feeling rather shredded :). I dont want to miss a training session because secondary muscles are still sore I been eating heaps of fish, meat cheese not so much eggs cooked but I blitz a couple in a blender with a shake in the morning things like that, but i feel my body still needs more so any advise would be great cheers mate. Yes a post-workout shake starts the repair process straight away Gazo. Ill have one now then thanks Mark keep up the brilliant work. I have also read a study that showed regular whey protein alone, post workout, has been proven to be more effective than whey protein with sucrose or dextrose added. I dropped PWO carbs a while ago. I feel better since I’ve stopped taking them PWO as well. So final decision is to ditch the workout carbs? And also, should I shift around my meal plan so that the carbs are still split 50/50 for before/after the workout? Adam, yes. Suit yourself on this, it’s completely up to what works best for you. Since the study, as described, has no control group NOT taking post-workout protein. How does the author come to the conclusion that specific post-workout protein aids muscle synthesis? In regards to Post workout Carbs on Friday which would be the day to start the Carb up period. How long after the workout should I wait to start the carb up period? were you a skinny guy who wanted to build muscle? or an out-of-shape fat guy who lost weight AND built muscle at the same time. do you have “before” pictures? What about PWO on a Carb-Up day? ….. wait for the next carb meal is the answer, eh? @Doug. You can have them. They just won’t do anything beyond what protein alone will do. I really like this site, but a have to disagree with this article. I do not use any supplements, or milk products. Instead, my dinner is usually ready right after workout. I differ to eat different types of bean, lentils with vegetables, and fish. Nutritional content of beans and lentils, is about 25g protein, and about 50g carbs. Have heard before that carbs make it difficult, to transform the body into the athletic. And that sugar stops the blood supply to the muscles, due to insulin resistance from the sugar. But there is a difference between, carbohydrates from sugar and beans / lentils. Muscles also need glucose, after a hard training session. It is impossible to live on pure proteine ​​diet from morning to night. I still try to replace the carbohydrates I eat for breakfast and evning meal. With about 50g almonds nuts, for each of the meals instead. Almonds contain a lot of unsaturated fat. Would you recommend my diet? And will the unsaturated fats from nuts, prevent proteins from reaching my muscles? Carbs are the only macro your body does not need to survive that being the case how many carbs do we really need? We also get carbs and fiber from veggies nuts and other foods considered low carb! People you need to cook your eggs! Your body is physiological incapable of digest raw eggs. The Rocky morning shake may look badass but is plain stupid. Mark if carbohydrates to your PWO shake has no impact on muscle growth and only serve sugar calories to your diet and hinder burning FAT after a workout why [removed details: Mark] Is the PWO carbs just to help bring up calories and if so wont it effect burning fat after workout ? Been meaning to discuss this very interesting topic with you for a while now. Then I get the email and here is my chance to do so! I agree with you that we are more insulin sensitive after a good weight lifting session so the post carbs are not needed. Additionally, based on quality sources which I have come across over the years (including your site) whey on it’s own creates a higher insulin spike than white bread, sugar, honey etc. so there is no need. But at some point, I am going to need to eat carbs (for water and glycogen) to restore my reserves and so that I can perform for the next session in the gym, correct? (Note, I am not on MANS diet. My current diet is like GLAD but with the intermitted fasting component built in). I guess my question is this: Are there any studies that you know of which indicate how long the fat burning window last for while on whey alone? Also, my current whey protein isolate has 2 grams of carbs per scoop (1 of which is sugar) and 35 grams of protein. Am I kinda screwed here? Does it have to 0 grams? Or will I have to try to hunt down a completely zero carb formulation during my next purchase? @Ochen. The protein from beans and lentils is not “complete” protein i.e. it doesn’t contain all the amino acids. You should take a whey shake immediately after training, then your beans, lentils, and fish within 3 hours of finishing that shake. @Eduardo. You must not have read the article. I cover all your points. – Yes carbs with whey will cause a greater spike in insulin, but it’s not required. The insulin spike that comes from whey alone is enough (see article). – Glycogen will be replaced when you eat carbs later. – Whey alone will not cause muscle loss lol. I covered this in the article with the scientific studies. It’s been clearly shown that adding carbohydrates to whey does nothing to decrease muscle breakdown levels. Nor does it increases protein synthesis levels. @KRS. I covered this in the program itself – it is simply a matter of convenience for hitting cals and macros. It’s not for building muscle or fat burning purposes. Burning fat on that program is taken care of by all the other factors that make up the diet. @Henri. Yes, you simply replace glycogen from your GLAD meals that come after the workout. I’m not aware of any studies, but you’ll continue to burn some body fat for a few hours after training. When you start eating solid food again, your body will use it for energy. But your overall metabolism can remain elevated for 36-48 hours after the workout. After workout, our blood is full of aminoacids(taken from muscles) and catabolic hormones. The PWO shake shouls stop this process quickly. The better way to do this is elevating insulin. 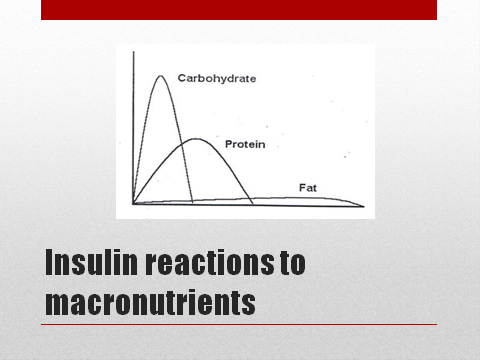 Once insulin is elevated, the cabolic process stops and anabolism takes place. Using whey alone will elevate insulin, but the body will burn a good part os this protein to obtein energy. This will be the most expensive carb ever !! Dextrose is so much cheaper and do this job better. Once insulin starts, the fat loss stops either way. As said before, glycogen is important to prevent muscle loss and for recovery. I don’t understand why we have to wait for this replacement. I can take 100gr of dextrose in my shake, but once my other macro nutrients and calories during the day are counted, won’t cause fat storage. @Eduardo. Yes there are many things involved – all of which are covered and scientifically proven in this article. Adding carbs to your whey does not slow or stop the catabolic process any more than whey alone does – see study no.2 above – “PWO carbs do not slow muscle breakdown”. The body will not burn protein from whey after your workout. The body never burns protein for general energy purposes except in extreme emergency situations. I’ve built my body over the last 7-8 years without any PWO carbs. You also seem to be under the impression that you burn all the glycogen out of your muscles during a workout. Even a full body session will burn a minority of glycogen, leaving most of your stores intact. Anyway, whether it’s protein synthesis, muscle breakdown (catabolism), insulin, or glycogen, there’s no need for opinion on this – the science is in, and there is no good reason to be putting sugar into your post-workout whey shake. I used to take PW carbs with my protein because that’s what I was told I should do. I ditched the carbs after reading your articles, and the results showed up almost instantly, plus I just felt better without taking in all that dextrose/maltodextrin. I didn’t see any negative effect on muscle gain either. Any thoughts on the process of Carb Backloading? I have been adding Carbs PWO because my Carbs throughout the day are very low. I basically get my daily intake in the 2 hour period post workout. What if we don’t drink a PWO shake? I don’t have the money to buy protein powder at the moment, I only get all my protein from food. What do you suggest I eat after my workouts?